Part three in this weekends Saturday Afternoon Platter post. Read the other parts here and here. I love melba toast but I almost didn’t post this recipe, I was going to tack it on the end of my marinated feta post as I wasn’t really sure I could actually blog about toast! But melba toast is so versatile. 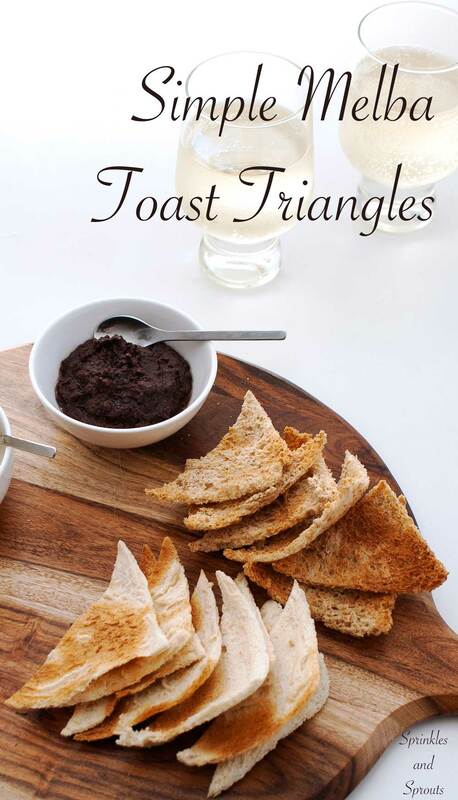 The little crunchy triangles are perfect for dipping, for spreading with pâté, for serving with a starter, they even (if cut slightly smaller) make great croutons for soup. The method for making melba toast is pretty simple, it is just toast! But the key is to get the bread super thin, so that it curls up slightly and becomes super crispy. The bread is toasted, the crusts are removed and once you have removed the crusts you cut down the full length of the bread to create two very thin slices of toast. 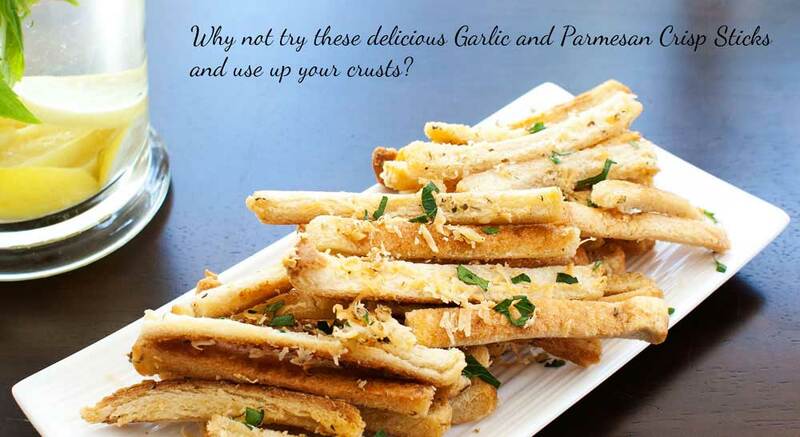 If you want a way to use up your crusts, then why not try my Garlic and Parmesan Crispy Sticks. 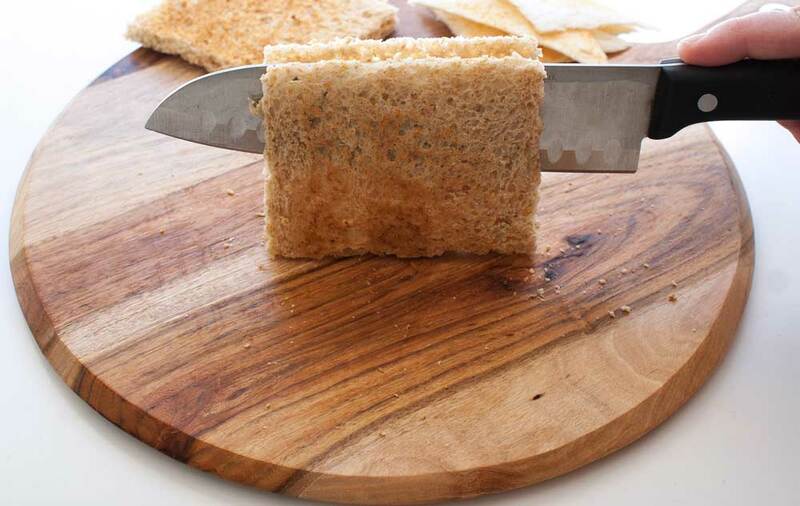 Make sure you use a sharp non-serrated knife to cut through the bread. Once back under the grill the idea is to get the bread nicely crisped but to ensure a light golden colour. Have the grill pan on the lowest level and don’t be tempted to turn the grill to high, medium is best as you get a more even colour. If you love this recipe why not sign up for my FREE weekly newsletter, packed with recipes, tips and tricks. Place the slices of bread onto a baking sheet and toast them lightly on both sides. Cut the crusts off each slice of toast. Using a non-serrated knife carefully slice through the middle of each slice, (see picture above) to give you 2 thin slices. Cut each of thin slice in half to create 2 triangles. Put the triangles, untoasted-side up, onto a baking sheet and place back under the grill to crisp. This will take about 2 minutes depending on your grill. Watch them carefully as the toast will burn easily. Bring back the Melba toast I say! The oldies are the goodies – this reminds me of my Mum making Melba toasts when I was a kid and we thought it was fancy food 🙂 We used to love piling slices thick with jam. Although these days I’m a little more partial to a nice pate with my Melba toast. Yes!!! Pate and melba toast….so good. And so much nice than a lot of the crackers that are on the market! I’m glad you decided to blog about toast! Sometimes I get so frustrated at the cracker aisle in the grocery store. This a great alternative!